The pco.edge 4.2 LT camera is equipped with an innovative scientific CMOS sensor (sCMOS) providing crisp images and precise measurements. 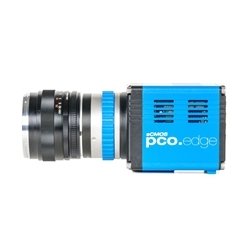 The pco.edge 4.2 LT camera system is designed for users who require the highest quantum efficiency. The monochrome camera has 16 bit dynamic range, long exposure times and extremely low noise readout. Please contact Microscope World for a quote or further information on the pco.edge 4.2 LT camera. View pco.edge 4.2 LT data sheet.